There are no traditions clustering around pottery making in Samoki. The potters say they taught themselves, and have always made earthenware. 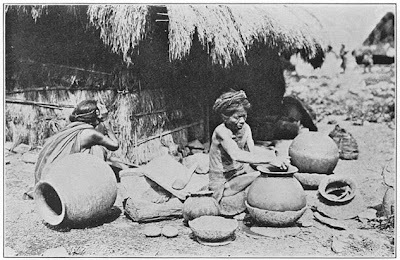 To-day Samoki pottery is made of two clays one a reddish-brown mineral dug from pits several feet deep on the hillside and the other a bluish mineral gathered from a shallow basin situated on the hillside nearer the river than the pits, and in which a little water stands much of the year. Formerly Samoki made pottery of only the brown clay, and she used cut grass intermixed for a temper, but she claims those earlier pots were too porous to glaze well. Consequently the experiment was made of adding the blue surface clay, in which there is a considerable amount of fresh and decaying vegetable matter—probably sufficient to give temper, although the potters do not recognize it as such. The clay pits lie north of Samoki, between a quarter and a half of a mile distant, and the potters go to them in the early morning while the earth is moist, and dig and bring home the clays. 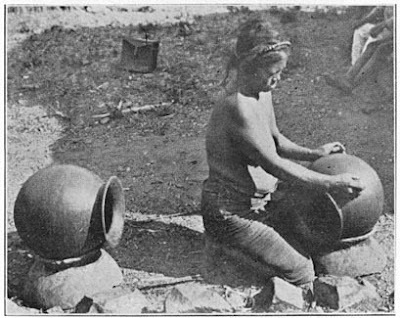 The woman gathers half a transportation basket of each of the clays, and while at the pits crudely works both together into balls 4 or 5 inches in diameter. 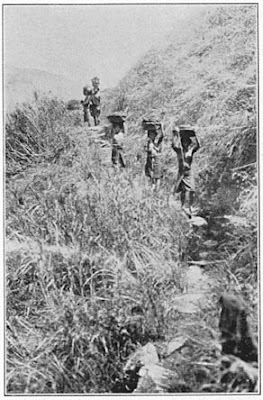 In this form the clay is carried to the pueblo. All the pottery is manufactured in the shade of the potter’s dwelling, and the first process is a thorough mixing of the two clays. 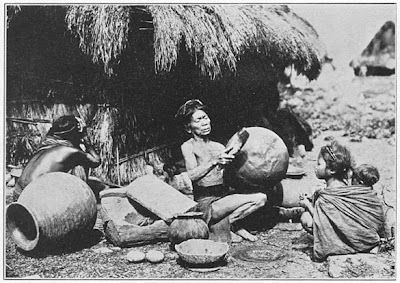 The balls of the crudely mixed material are put into a small, wooden trough, are slightly moistened, and then thoroughly worked with a wooden pestle, the potter crouching on her haunches or resting on her knees during the labors. After the clay is mixed it is manipulated in small handfuls, between the thumb and fingers, in order that all stones and coarse pieces of vegetable matter may be removed. When the mortarful has thus been handled it is ready for making pots. A mass of this clay, thoroughly mixed and plastic, is placed on a board on the earth before the kneeling or crouched potter. She pokes a hole in the top of this mass with thumbs and fingers, and quickly enlarges it. As soon as the opening is large enough to admit one hand it is dug out and enlarged by scraping with the ends of the fingers, and the clay so gathered is immediately built onto the upper rim of the mass. The inside is next further scraped and smoothed with the side of the forefinger. At this juncture a small mass of clay is rolled into a strip between the hands and placed on the upper edge of the shaping mass, completely encircling it. This roll is at once shaped by the hands into a crude, flaring rim. A few swift touches on the outer face of the crude pot removes protruding masses and roughly shapes the surface. The rim is moistened with water and smoothed inside and out by hand and a short, round stick. The first stage of manufacture is completed and the vessel is set in the sun with the rim of an old broken pot for a supporting base. In the course of a few hours the shaped and nearly completed rim of the pot becomes strong and set by the heat of the sun. However, the rough and irregular bowl has apparently retained relatively a larger amount of moisture and is in prime condition to be thinned, expanded, and given final form. The pot is now handled by the rim, which is sufficiently rigid for the purpose, and is turned about on its supporting base as is needed, or the base is turned about on the earth like a crude “potter’s wheel.” A smooth discoidal stone, some 4 or 5 inches in diameter, and a wooden paddle are the instruments used to shape the bowl. The paddle is first dipped in water and rubbed over one of the flattish surfaces of the stone slightly to moisten it, and is then beaten against the outer surface of the bowl, while the stone, tapped against the inner surface, prevents indenting or cracking, and, by offering a more or less nonresisting surface, assists in thinning and expanding the clay. After the upper part of the bowl has been thus completed the potter sits on her feet and haunches, with her knees thrust forward from her. Again and again she moistens her paddle and discoidal stone, and continues the spanking process until the entire bowl of the pot is shaped. It is then set in the sun to dry—this time usually bottom side up. After it has thoroughly dried, both the inner and outer surfaces are carefully and patiently smoothed and polished with a small stone, commonly a ribbon agate. During this process all pebbles found protruding from the surface are removed and the pits are filled with new clay thoroughly smoothed in place, and the thickness of the pot is made more uniform. The vessel is again placed on its supporting base in the sun, and kept turned and tilted until it has become well dried and set. Two and sometimes three days are required to bring a pot thus far toward completion, though during the same time there are several equally completed by each potter. There remains yet the burning and glazing. Samoki burns her pots in the morning before sunrise. 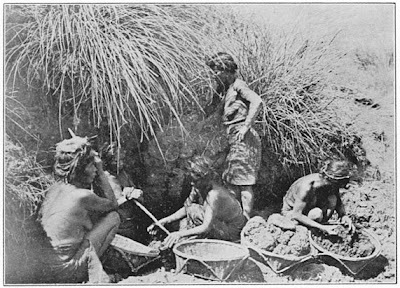 Immediately on the outskirts of the pueblo there is a large, gravelly place strewn with thin, black ash where for generations the potters coming and going have completed their primitive ware. 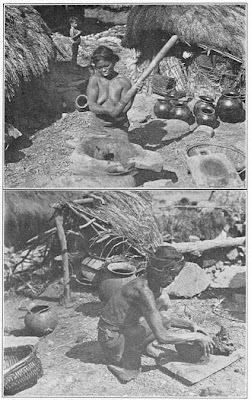 Usually two or more firings occur each week, and several women combine and burn their pots together. On the earth small stones are laid upon which one tier of vessels is placed, each lying upon its side. Tier upon tier of pots is then placed above the first layer, each on its side and each supported by and supporting other pots. The heat is supplied by pine bark placed beneath and around the lower layer. The pile is entirely blanketed with dead grass tied in small Page 120bunches which has been gathered, prepared, and kept in the houses of the potters for the purpose. The grass retains its form long after the blaze and glow have ceased, and clings about the pile as a blanket, checking the wasteful radiation of heat and cutting out the drafts of air that would be disastrous to the heated clay. As this blanket of grass finally gives way here and there the attending potters replenish it with more bunches. The pile is fired about one hour; when sufficiently baked the pots are lifted from the fire by inserting in each a long pole. Each potter then takes a vessel at a time, places it red hot on its supporting base on the earth before her, and immediately proceeds, with much care and labor, to glaze the rim and inside of the bowl. The glaze is a resin obtained in trade from Barlig.